Climb Duration: 3 days minimum. BC coast weather and the strenuous nature of the approach suggest allowing an extra day. Other peaks in the area provide multiple additional opportunities to enjoy this beautiful area. Elevation gain (Cumulative): approximately 10,500 feet ... 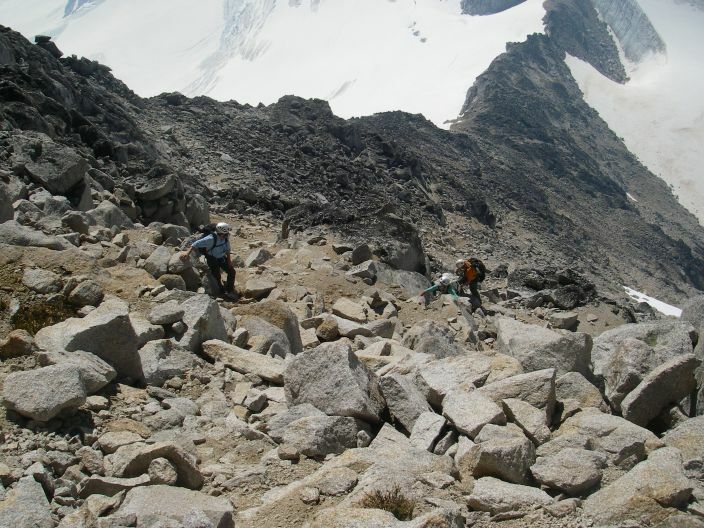 Ascent to hut 4500 feet, Hut to summit and return 4300 feet, “Descent” to TH 1800 feet. Hiking/Mountaineering Distance (one way): Reports give distance to the hut as 12 km (7.5 miles). GPS readings (GM) indicated 11.5 miles. Harrison hut to summit estimate: 5-6 miles. Total round trip rough estimate: 30-35 miles. Difficulty: Strenuous approach on a well marked route. Not really a trail but easy to follow. 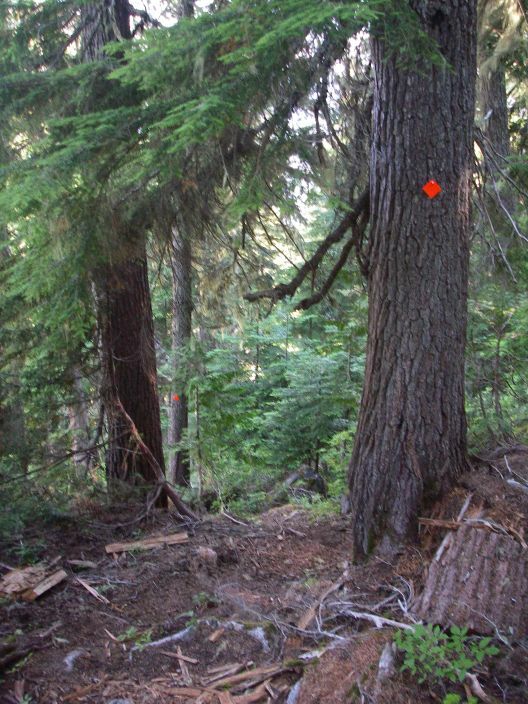 Expect some brush, log hopping in clearcut areas, continuous side-hilling, potentially hazardous stream crossings depending on the season and generally steep terrain. 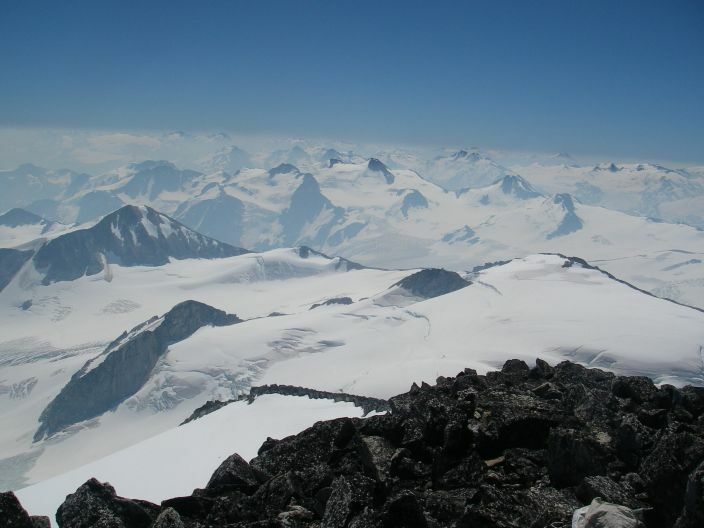 From Harrison hut the climb is over low angle crevassed glaciers, steep and loose boulder slopes and Class 3 rock. 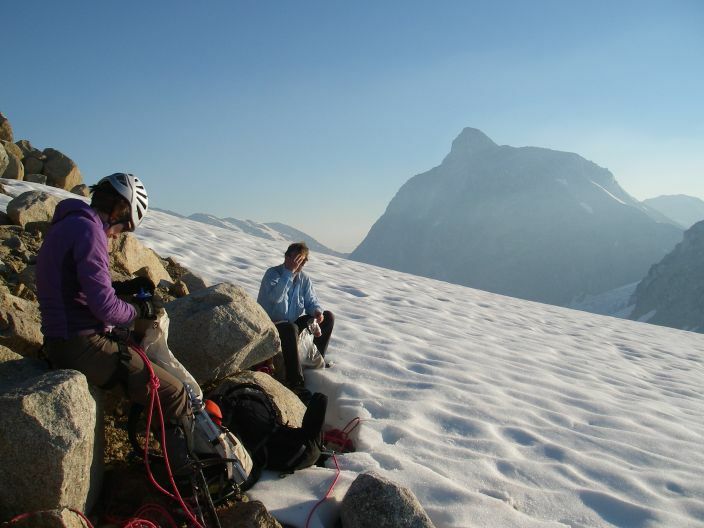 Overseer Mountain is the highest mountain in the Pemberton Icefield region. 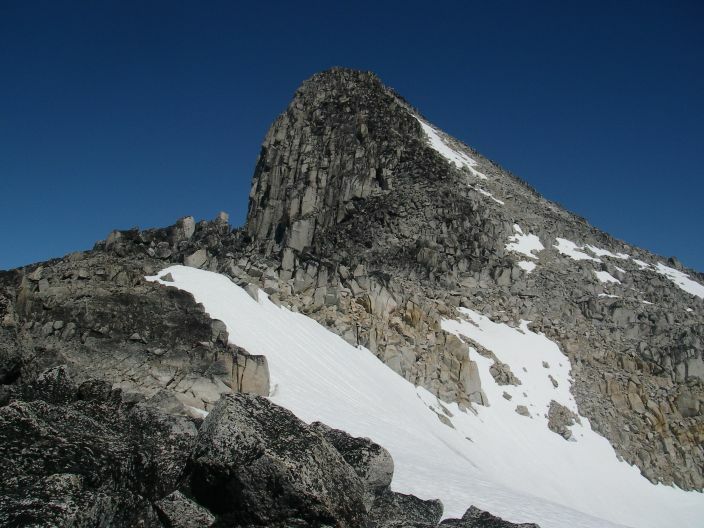 Traditionally accessed from the locally popular Meager Creek Hot Springs via Harrison Hut, this peak became much more remote due to the Capricorn Creek landslide. 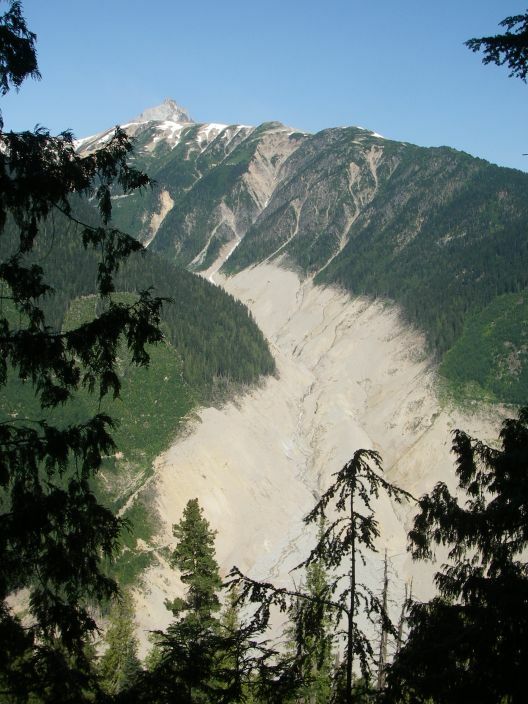 This slide which occurred on August 6, 2010 was perhaps the largest in Canadian history, completely burying the surrounding area and eliminating any possibility of using the historical approach. 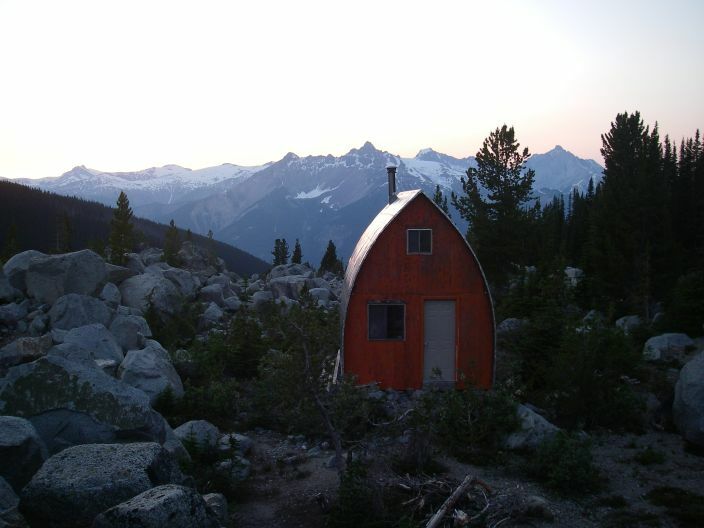 Harrison Hut was originally built by the Varsity Outdoor Club (VOC) of the University of British Columbia in 1983 and is situated at about 5,700 feet in a stunning alpine setting. From Meagher Creek Hot Springs no formal route to the hut ever existed and the approach was a strenuous cross-sountry affair. Hence this peak has still seen relatively few ascents and the area is astonishingly pristine in nature. The hut is open to the general public on a first-come, first served basis although the VOC request that you register beforehand to let others know what to expect when they arrive. Although technically free of charge a donation of $5 per person per night is suggested. A blue donation box is located high near the ladder leading to the sleeping loft. 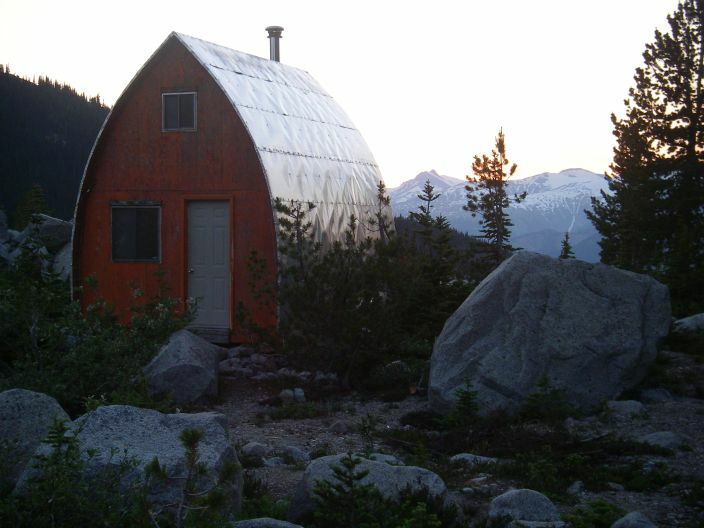 The hut is in good condition and has a cookstove and some utensils; although the stove was reported to leak so consider bringing your own. The club journals dating back to the late 1960s make for very good reading and provide some history and perspective on the area. Near the hut there are several sites suitable for tents although given that hut usage is quite low it seems unnecessary in retrospect to carry one if doing the approach in a single day. 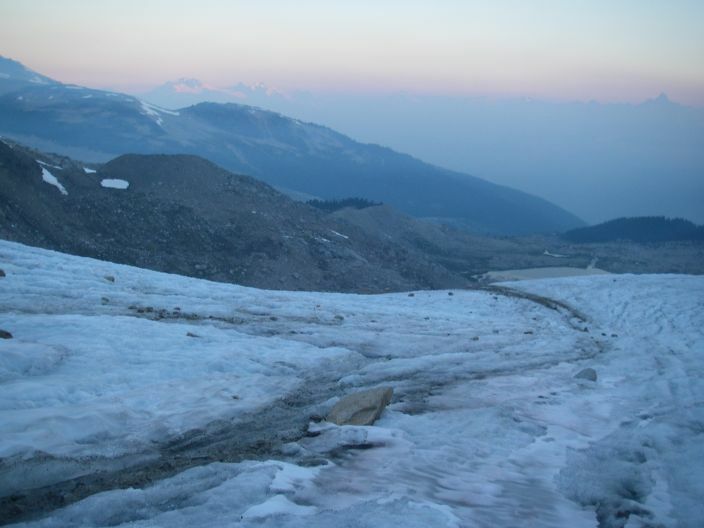 Since 2012 extensive efforts have been made by the VOC to re-establish a route/trail to the hut. This effort continues and progress can be followed on the VOC website. Currently the route is very well marked with closely spaced orange reflective diamonds. A rudimentary tread has been established but do not expect anything resembling a bona fide trail. In places it is steep and treacherous with the potential for serious mishap almost constant. 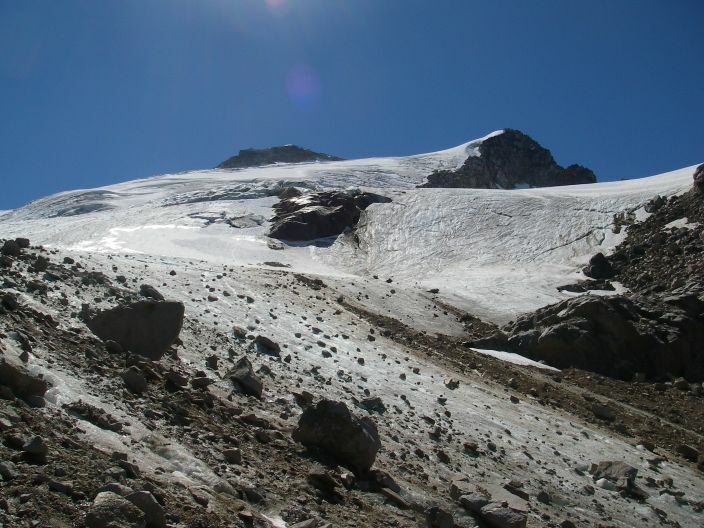 The best time to climb this peak would be early summer (June-July) when snow still covers the glacier. 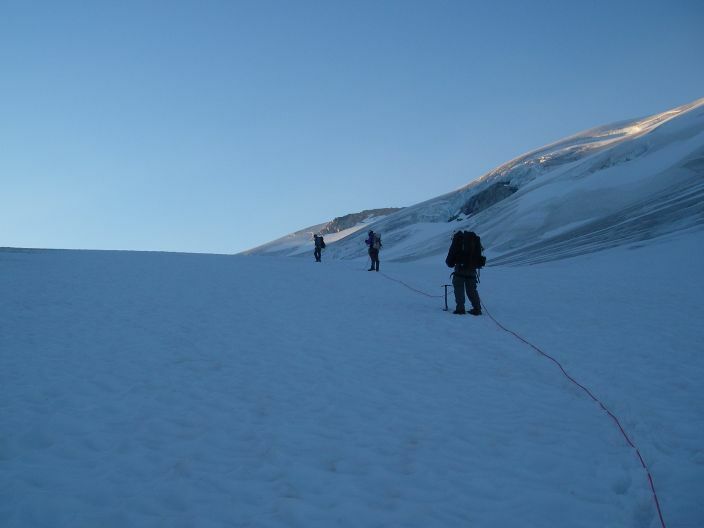 Later in the season crevasses would likely increase the difficulty. Start driving on the Pemberton Meadows Road. At the T intersection a short distance out of town turn left. The arm to the right is signed Pemberton Farm Road. Zero odometer here. The general idea is to stay on the Lilloet River's south bank. 13.5 Lilloet FSR – go straight. 14.5 Bridge over Salmon Slough. right next to the Lilloet River and is possibly subject to flooding. 33.5 Minor spur to left (do not take). 33.8 Bridge (not far beyond km 23 sign). is steep and loose although generally in good condition. 4WD recommended. 37.8 Signed TH (before the road's end). Parking space for two to three vehicles. Elevation here is approximately 2950 feet. the main road on the river's opposite side was closed due to severe landslide potential. This google maps link provides pertinent details of the approach route as of Oct 2013. Some additional work was done in late June 2014. Updated information and photographs should be available on the VOC website address. Additional comments: There are sections of the route which are quite steep and ropes have been installed to provide a hand line. Some of these ropes are quite worn and are not to be trusted. I suspect if work on the route continues they may be replaced but in the meantime careful inspection is warranted. Additionally we encountered high water levels creating treacherous conditions at the Hot Springs Creek crossing due to unseasonal heat (102 degrees in Pemberton). 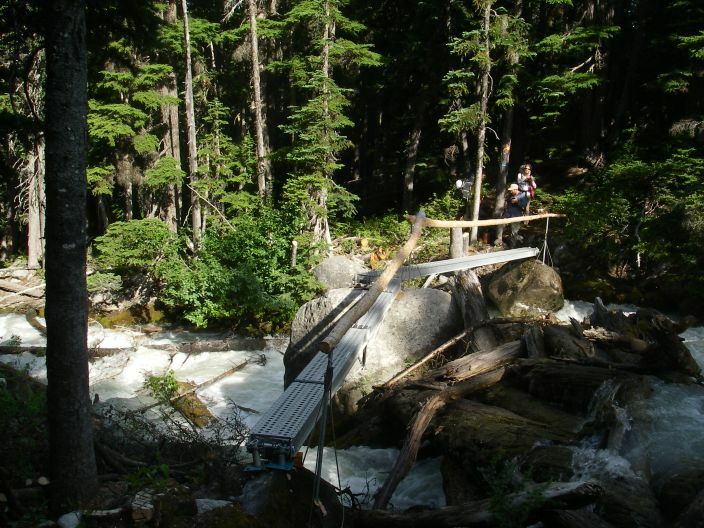 The bridge was present at Barr Creek and a boulder scramble was required for the final creek crossing at the hut. 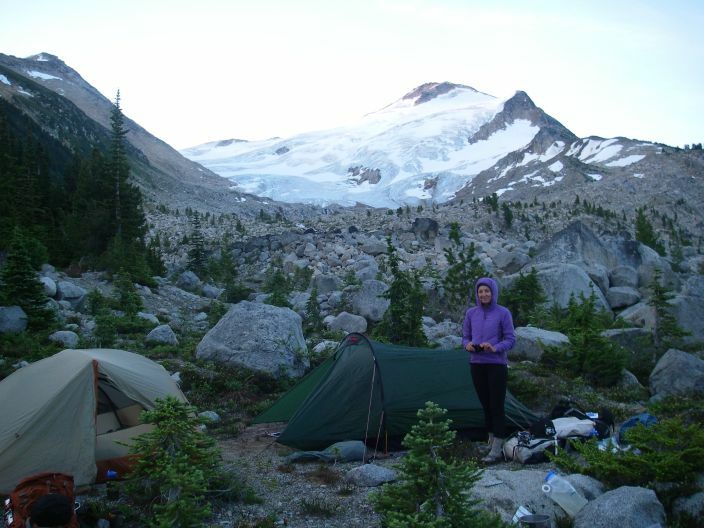 If starting later in the day or just wanting to do easier days it is possible to camp near the logging road junction which is roughly the halfway point. There are water sources both before and after the junction and the roadbed is sufficiently level in places to allow for multiple tents if necessary. From the hut Overseer's summit is not visible. The rocky peak on the creek's northeast (opposite) side is Frozen Boot. 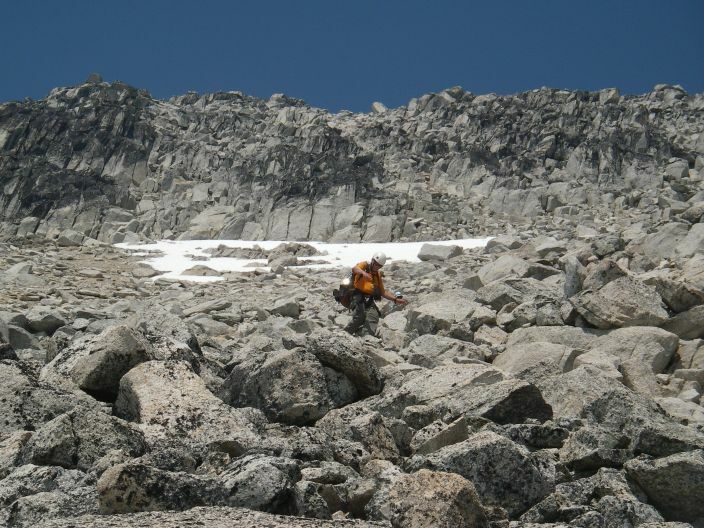 Grant Myers reported some third class scrambling near its summit. The glaciated peak up-valley to the southeast is Zygo and appears to be another worthwhile objective. Note that this the ascent of Overseer will take a full day so an alpine start is very highly recommended. To ascend Overseer begin heading upstream from the hut (elevation ~5700 feet) over generally easy and open terrain. Immediately above the hut it may be easiest to veer slightly away from the creek to avoid some large boulders. Once beyond this area it is easy to stay near the creek and follow it to a small lake (elevation ~5900 feet). 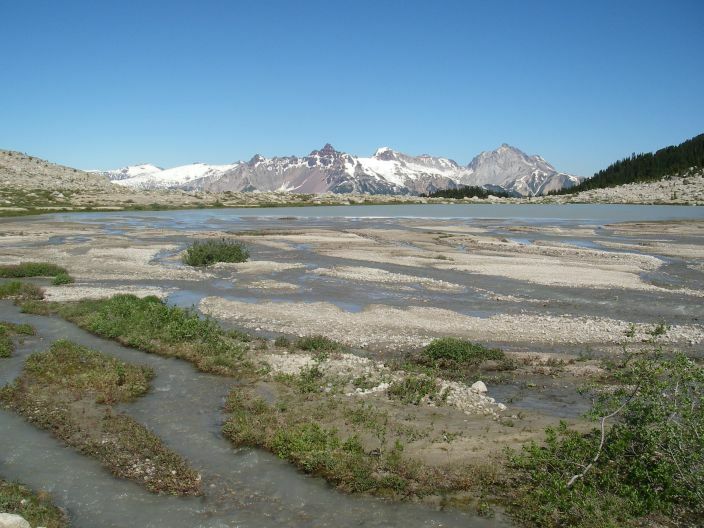 Travel around the lake and continue up the valley toward the glacier's toe and stay to the right (SW) of the main stream course. 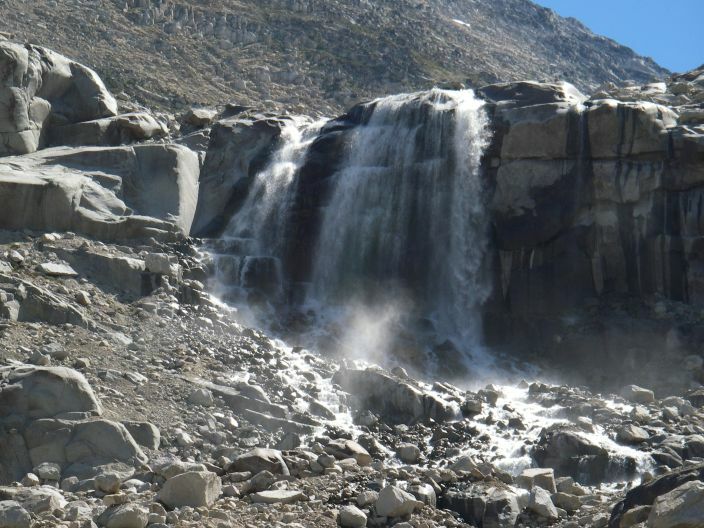 A waterfall was passed on the left in this region. 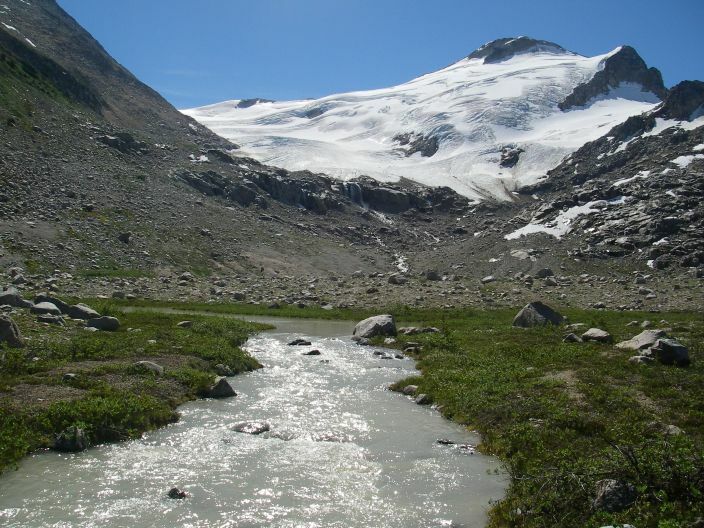 As you near the glacier the terrain roughens and care must be taken as the meltwater percolates underneath the rock-covered ice to create large holes and hidden ice bridges. Reach the glacier at ~6300 feet. This is the place to rope up. Once on the glacier travel is relatively easy. The angle is low although obviously care must be taken to avoid crevasses. 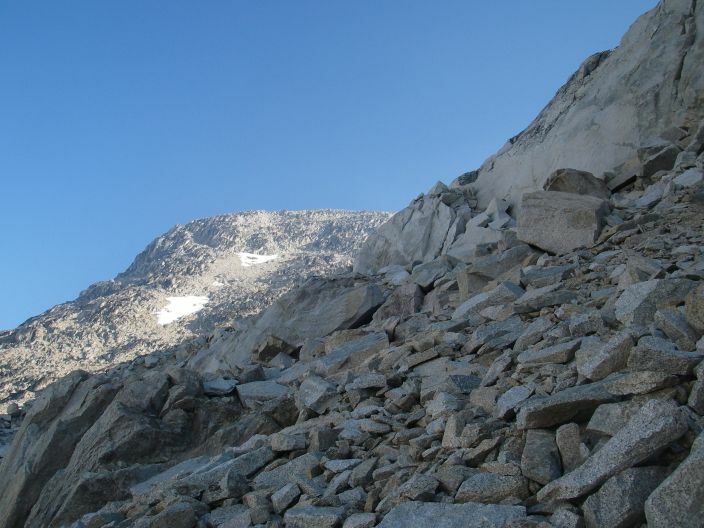 Ascend eastward to the obvious col (elevation ~7700 feet) at the base of Frozen Boot's SE ridge. From the col Overseer will finally become visible. 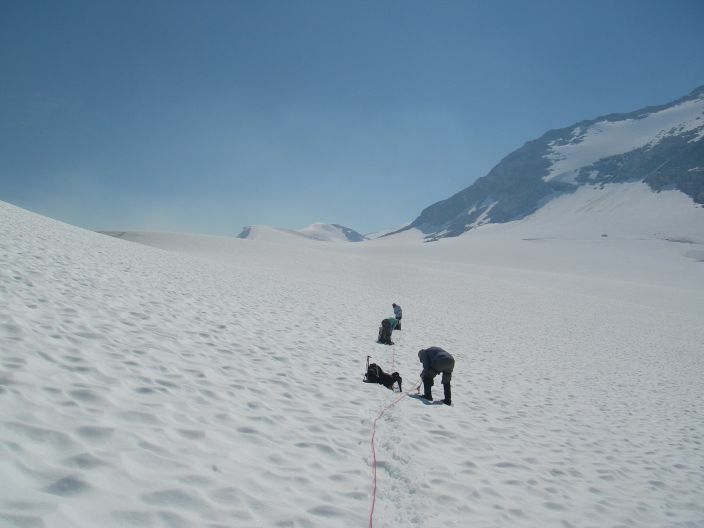 Descend from the col to ~7200 feet on the low angled glacier heading directly toward Overseer. Near the peak's southwestern base turn right (east) up the arm of the glacier descending from between Overseer and Madhorse Peak to the south. 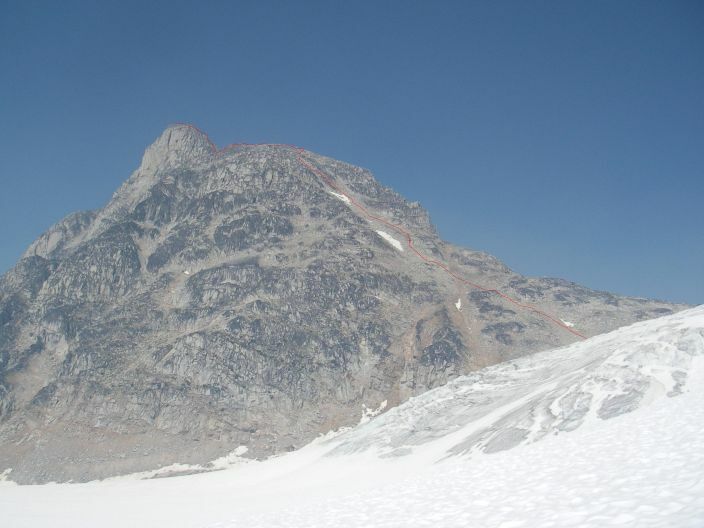 The easiest line is on the glacier's left side, north of the “icefall” and will not be visible until almost upon it. Ascend to about 7600 feet and then look for the easiest line heading up the loose and bouldery SW slope. Unrope here. Glacier gear can be stashed at this point. Although there is considerable route latitude ascending the SW slope, aim for the high leftward slanting ramp/gully (seen above Grant beginning on the snow's right side in this photo) near the ridge line's top at 8600 feet or so. Our approximate line of ascent (hand drawn red line) is shown here. 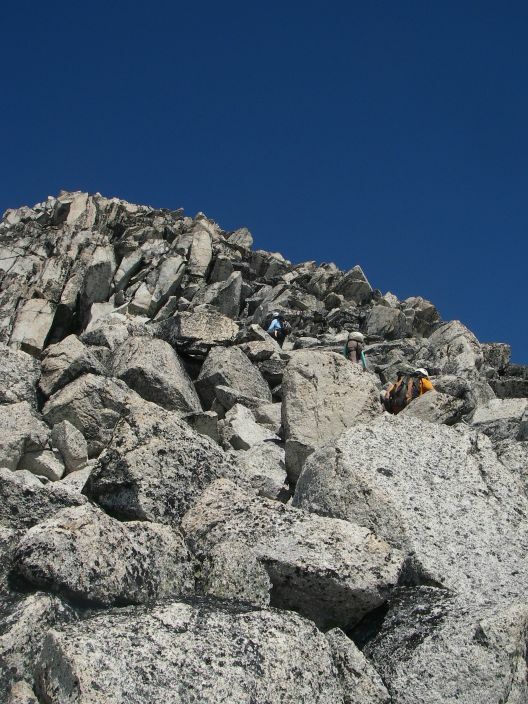 This provides easiest plateau access and ridge above as you approach the summit tower. 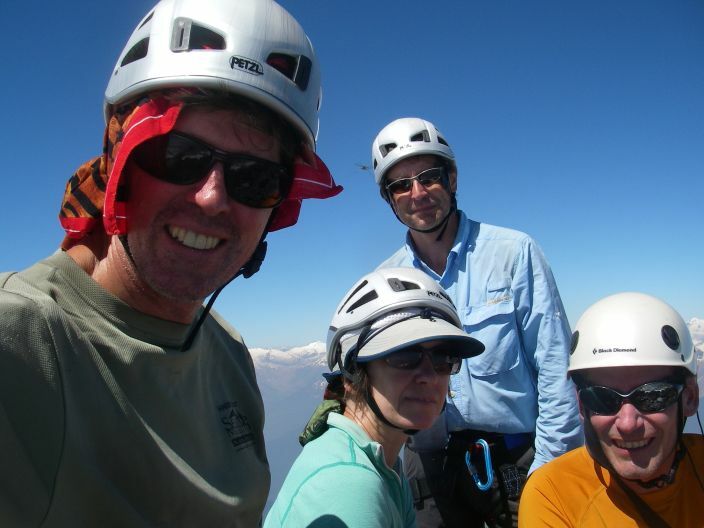 The easiest summit route generally follows the ridge, although again there is significant route latitude. Difficulty should not exceed Class 3. Grant Myers’ beautiful photographs are posted on Shutterfly. 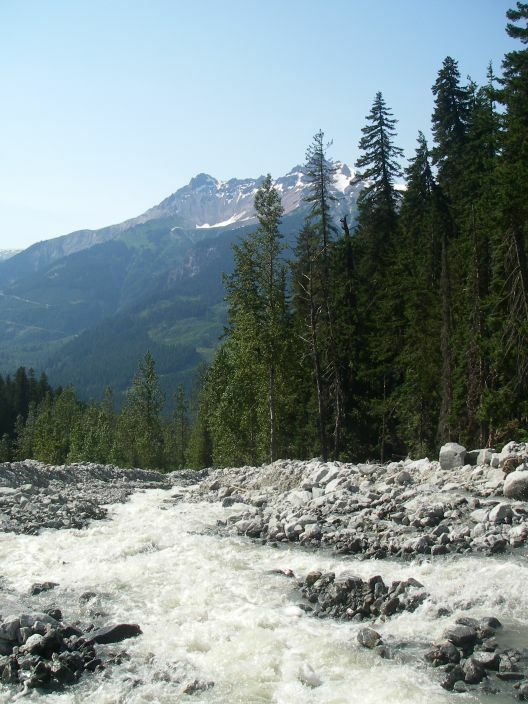 Other reports can be found on the ClubTread website - a good resource for reports in southern British Columbia. Use the “search” tab on the home page's right side to locate trip reports.